The Grand Prix Foundation of Long Beach was incorporated in January of 1991 as a 501 (c)(3) publicly supported organization whose purpose is to raise funds, through a series of charitable events held in conjunction with the annual Acura Grand Prix of Long Beach. Building on the drama and fanfare surrounding the race, which annually attracts crowds in excess of 180,000, the Foundation schedules exciting events open to businesses and public participation. The Grand Prix Foundation presented the annual Grand Prix 5K Run/Walk on Sunday, March 31. More than 1,100 participants had the unique opportunity to “run the course” on the Grand Prix race circuit. The 5K course started at the official Grand Prix start/finish line on Shoreline Drive, then headed up Pine Avenue and Seaside Way, returning to Shoreline Drive on a two-lap tour of the circuit. Each paid runner earned a finisher medal, a Grand Prix 5K t-shirt and a Friday ticket to the Acura Grand Prix of Long Beach! Friday, April 12: Grand Prix Foundation Monte Carlo Night will feature casino-style gambling from 7 p.m. to 10:30 p.m. at the Renaissance Long Beach Hotel and includes a poker tournament. 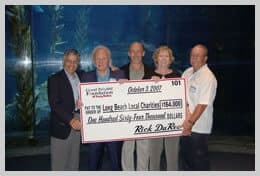 Winners vie for prizes and the Grand Prix Foundation of Long Beach and the causes it supports benefit. Local philanthropists, community supporters, business leaders and various race series drivers are invited to help raise thousands of dollars. Race attire is welcome! Come straight from the track, if you like, relax and taste food from local restaurants. Please use the link below to make a tax-deductible donation to the Grand Prix Foundation of Long Beach. The Foundation (Federal tax number 33-0446818) was founded as an “all-volunteer” organization and continues to operate as such. Generous support from corporate sponsors allows the Foundation to keep overhead to an absolute minimum. The Foundation’s activities are governed by a twelve member Board of Directors, each elected to a two-year term. Beneficiaries are selected by a committee and members of the Board and approved by the Board of Directors. The Foundation benefits as broad a cross section of the community as possible and continually re-evaluates the needs of the community. The Foundation, in 1997, established the annual Robert E. Leslie Memorial Scholarship program which provides a $1,500 grant to seven graduating seniors from the seven high schools in the Long Beach area. Leslie was a former Long Beach Fire Chief and founding director of the Foundation. Students are selected by a panel of civic leaders and are evaluated on scholastic achievement, potential, extra curricular activities, community service and financial need. Information on applying for these scholarships is coming soon! The Grand Prix Foundation, since its inception in 1991, has donated more than $4 million to Southern California charities. In addition, the Foundation donates tickets and hospitality packages to the Acura Grand Prix of Long Beach and tickets to the Foundation’s “Grand Prix Charity Days” events to charitable and civic organizations to assist them in their fund raising efforts or, in some cases, to bring the physically or mentally challenged to a “day at the races.” For more information on the Grand Prix Foundation, please call the Foundation office at (562) 490-4509. To request a ticket donation for a charitable organization in the Long Beach area, please send a letter to: Grand Prix Foundation of Long Beach, 3000 Pacific Ave., Long Beach, CA 90806.